This is a small spot area in my car before I attacked it with Dash Away. You can see where my floor mat had been. Ok, you busy parents of little mess makers, hold onto to your carseats because we’ve got a product that will absolutely make your “must haves” list! I was contacted by Surf City Garage out of Huntington Beach, CA with a cleaning product they said couldn’t be beat. Having five children of my own and the various messes that accompany them, i have tried innumerable products and none seem to completely live up to their claims of “miraculous” cleaning power. So I was naturally quite skeptical of Surf City Garages claims for their Dash Away all purpose cleaning product. It arrived on my doorstep with the guarantee from its founder, Tim Miller, that “when used as directed, if this product isn’t the best you’ve ever tried, give me a call and I’ll buy it back.” As you will see from the pictures, I have no intention of calling Mr. Miller! This is the picture I took of the same area about 2 minutes after I applied Dash Away. 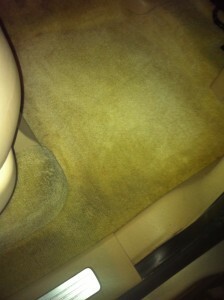 You can barely see the earlier line of grime defining where the floor mat had been! 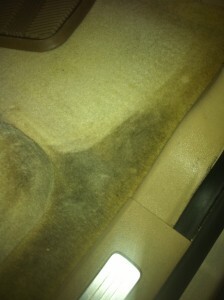 I decided to test it out on some of the toughest, most resilient stains I have at my disposal… my car. I have had the carpet professionally cleaned several times and was told to resign myself to the fact that certain stains are just impossible to remove. I very skeptically followed the directions for Dash Away…shaking the bottle, spraying a light mist over the stain, and then wiping it clean with a rag. Way too simple, I thought, until I began to actually “see” the stain begin to disappear! And as if thats not enough, it actually smells good too! Needless to say, I am now a devoted fan! The product is non toxic and safe to use on a number of materials like vinyl, leather, carpet, fabrics like car seats, strollers and the like. Although it was designed for car cleaning, the applications seem limitless. I have no problem endorsing this product and highly recommend it to anyone looking for quick, easy and thorough cleaning results (and it’s only $9.99!). I was able to clean the entire interior of my Denali in less than 15 minutes with results that were better than the $60 professional interior detail I not only paid for but also waited over two hours to have completed several months ago! Check out more info on Dash Away and other Surf City Garage cleaning products at www.surfcitygarage.com. Happy cleaning!